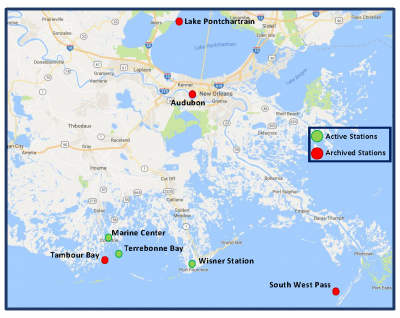 LUMCON’s goal is to document and quantify the changing landscape by leveraging high-resolution monitoring in the coastal southeastern Louisiana region. This will include the design and implementation of scientific surveys, monitoring programs, and investigations of the chemical, geologic, atmospheric, and biological environments. LUMCON’s monitoring stations are equipped with meteorological and hydrographic instrumentation. The operational stations collect and archive real-time data. To view our real-time data please click here. The DeFelice Marine Center tower is equipped with cameras that display views north, south, east, and west. To view these please click here. Unfortunately, for now, LUMCON’s environmental monitoring team is unable to fulfill requests for data collected prior to January 1st, 2016. We are currently working to apply quality control measures and correct discrepancies in our historical data archive. This will take some time so please be patient with us. If you would like to email monitoring@lumcon.edu, we can fulfill requests for data starting in 2016 until the present. If you have any questions or concerns or would like information on the instruments we use to gather this data, please email monitoring@lumcon.edu.